Internet Secure Reviews - Do They Provide Hassle Free Services? 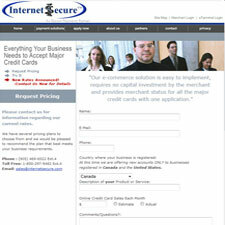 Internet secure offers what they call the complete solution to processing credit cards online. A Canadian merchant account and secure network account provider since 1995, Internet Secure offers transaction security and merchant account services. Internet Secure offers credit card processing for all the major credit cards, including Visa, Mastercard, American Express, and others in both USD and the Canadian currency. Internet Secure has an emphasis on simplicity and integration services that to move you from signup to accepting credit card transactions online quickly and with little hassle in real time. They called me back when I needed a merchant account within 1 hour, that is more than I can say for some of the other Merchant account providers, I liked Internet Secure, so far so good. Internet Secure has some of the lowest rates I could find anywhere. They have interac, online etc. However, after looking around I found that they don’t really work with most major software like Freshbooks invoicing. When I asked for support from InternetSecure they were not very helpful. Sometimes paying higher rates at alternative companies is worth it. Very satisfied with InternetSecure, we’ve been using and recommending them for years. They have the fastest and easiest – yet secure – integration with which we’ve worked. I very much wish they would be supported by freshbooks, but that’s really a freshbooks issue.